Here in the U.S., the kids all expect a visit from the tooth fairy when their pearly whites fall out. Have you even wondered what they do in other countries? Throw Your Tooth on the Roof tells you. In Columbia, kids expect El Raton Miguelito, who leaves money for the tooth. In Mali, kids throw their teeth in the chicken coop, and the unlucky chicken eating the tooth might end up as dinner. With cute illustrations and dozens of countries covered, kids will learn about traditions from around the world. The downside: the book has no plot, just a line or two from each country listed. This means it’s repetitive. How many times can you bear to read aloud that in this country or that country, the kid throws his tooth on the roof? Even my kids got bored after a bit. Here’s a hint: just read a few pages at a time, and get out a globe to show your kids the different countries. 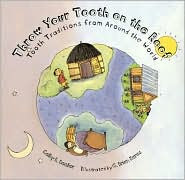 Throw Your Tooth on the Roof, by Selby Beeler, illustrated by G. Brian Karas. I do not have little kids at home, but I love what you did with this post. The book is a cute idea, but I can see how it could get boring after a bit. I love that you provided a great way to enjoy it, anyway.